It's NaNoWriMo again, and I am pleased that things have fallen into place so that I can write about a book that began in NaNoWriMo, 2008. 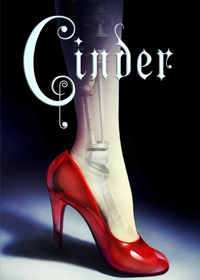 Cinder by Marissa Meyer is proof that NaNoWriMo can turn out a good book. First off, I should tell you that my knowledge of Cinderella is limited to the Little Golden Book version of the Disney movie. I'm no expert on the origins of the story. I can tell you, though, that I'm not a fan of the "Some day my prince will come" attitude that I associate with the whole Cinderella concept, even if it is Disney's fault. Ya get none of that in Cinder. Au contraire, the prince is damn lucky he stumbled upon Cinder, or it looks as if he will be at some point because I don't think I'm giving anything away to say that Cinder is book one in The Lunar Chronicles. Okay, so with this book you get Cinderella in a cyberpunk world. It's a world set far in the future, with royalty ruling a section of the Far East that includes China and the rest of the planet divied up differently with royal or elected rulers. Yeah, it's a post godawful world war situation, but not one that's particularly dire. This isn't The Hunger Games. There is a creepy group of people on the moon, though. In terms of the Cinderella thing that's going on here, Cinder doesn't leave her shoes anywhere. Instead, she struggles with her artificial foot because she's a cyborg. The prince doesn't see her across a crowded ballroom. He brings his android to her to be fixed because she's a mechanic. She has a wicked stepmother and two stepsisters, but they all have a lot more depth than you usually see in Cinderella variations. Yes, you will actually feel for poor old mom. Occasionally. At least I did. There's a cool standin for the coach, and a couple of days after I finished reading the book I realized there's probably a character who is functioning as the fairy godmother. A third-person story, people. You don't see a lot of that. My only quibble with this story is that Cinder is the point-of-view character, yet a few times the point of view shifts to the prince. But, remember, I am a writer who obsesses on things like point of view. And guess what? No annoying blurbs on the cover! I'm going to see my thirteen-year-old niece at Thanksgiving. I will ask her if she's familiar with cyberpunk. If she says, "No," I can assure her that Aunt Gail will take care of that hole in her reading. Cinder is a Cinderella story you can actually feel good about giving to a family member. Cinder is a Cybils nominee in the Fantasy and Science Fiction category.